What is Home Sweep Home? Home Sweep Home will entail a mass clean-up of 200 homes belonging to vulnerable elderly and those living with disabilities living in one- or two-room rental flats, as well as litter-picking across Chai Chee, Bukit Merah and Toa Payoh. Volunteers are invited to help out on Event Day at any of the three locations. A light version of Habitat Singapore’s regular home cleaning Project HomeWorks programme, where volunteers help clean up the houses of vulnerable elderly and people with disabilities living in one- and two-room rental flats. A mass litter-picking exercise where we seek to start conversations about what it means to care for one’s living space beyond the four corners of our homes. The event will be rounded off with a carnival that showcases the Habitat Village (an interactive exhibition of Habitat’s work), and potentially a participant-contributed collage to represent their collective efforts to make Singapore a decent place to live. 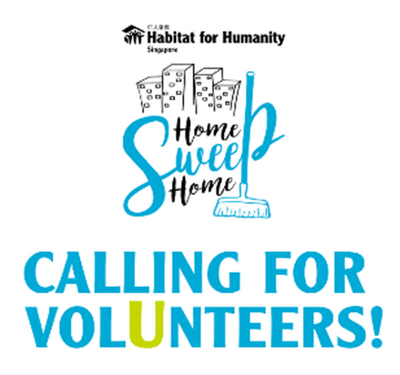 Volunteers will help to facilitate the litter picking segment of Home Sweep Home, usher teams and encourage conversation with participants on how we can inculcate a civic-mindset in keeping Singapore clean rather than clean-ed! Volunteers must be independent, responsible and eager-to-help. More importantly, you must enjoy working with people and ensure that the participants are well taken care of. Bonus points if you are an extrovert who enjoys engaging and motivating people! All volunteers will be required to attend one briefing held in late June. For enquiries, please contact Joyce at joyce@habitat.org.sg or 6744 7326. To register as volunteer, please click here.